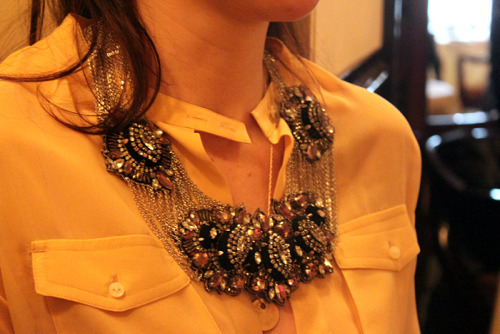 My friend Rachel wore the Windsor Necklace during NYC Fall 2011 Fashion Week. Isn’t it so pretty?? let’s go back in time to Friday. Friday? gosh it’s all a blur. anyway this was breakfast at Cipriani with Nina Garcia. joelle got a great shot of my mimosa colored blouse with the suzannadai bejeweled necklace i wore so she just sent it over. update on the Ninas- after the tragedy of Sunday night after the Behnaz show as recounted here i had the chance to redeem myself! As i was walking in to the Carolina show, we spotted Nina again across the runway, chatting with some other ladies. She looked up and caught my eye and I smiled. Then she ducked out of her conversation for a moment and I walked over to her and said hello and she immediately gave me bisous/bisous and hug and I launched into the most graceful apology I could conjure for having left her hanging. She smiled and laughed and waved it off and was of course gorgeous and gracious. A few moments more and the show was starting and I mean you can’t just keep Nina all to yourself, you’ve got to spread the love! So i thanked her and we went to our seats as the lights started to dim.